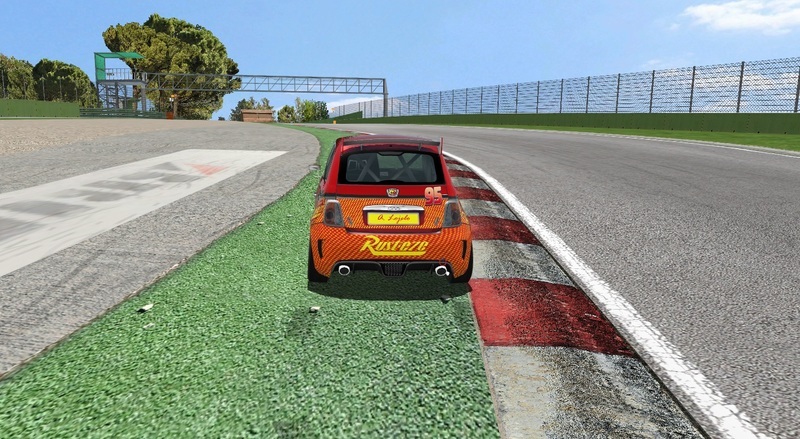 Welcome to the first race of the Radiator Springs 500 Abarth Series: Imola. NOTE: you need to install the netKar PRO v1.30.1727 RSR update to be able to access to our server. Our official server for the prequalification is up and running. It's called radiators-champ RSR. You need to installnetKar PRO v1.30.1727 RSR update ) to be able to join. The server will switch between qualification and races. As usual you can vote to go the next session simply pressing ESC > next session. We prefer to have racing sessions even for the prequalification period, so everyone get used to run closer to other competitors. Giving space, and learning how to stay in the group without causing avoidable accidents is something that we require from all of our participants. - at corner 13 (acque minerali) you can't go off track on the left. As an extreme case we will still consider valid if you go, by mistake, with all the tires on the green carpet on the left. Anything more than that is invalid. Just to be clear, that should not be the normal racing line there. You should do your best to be within the track. - at corner 15 (variante alta) we will allow you go to as wide as you want. This is an exception to the general rule. - if you gain unfair advantage cutting a corner, please lift off, and abort your lap. - during the race if you gain unfair advantage overtaking your opponent, please lift off and give back your position. Tonight we will have some testing races from 21:30 on. The server will have the live timing on. Lap times will be valid for the prequalification. Just noticed: The main site (radiators-champ.com) is not available at the moment, -anyway we can still meet on track today (at least the forum works). cu all later, I will be there too probably. It seems to be that the server web has still some issues. I hope it will be online soon. here are the images I promised yesterday. What about Pirratella? In all other cornes are we allowed to run on green extentions? Thank you. Anyway I am taking Lambo this time because I am so slow here. Not an issue to go wide at Piratella or any other place where the green extension is. At the end the only real problem is the Acque Minerali, where if you go wide off track (NOT ALLOWED as showed aboce!!!) you can carry much more speed. During the race it can happen that, by mistake we go wide at Acque Minerali. The important thing is that, in this case, we lift off, and if we gain a position there, we will give it back. Thank you Mario. Could you please also upload your skin as well? Today I was racing with some of you, but I saw only Luca's skin :-)) It adds so much immersion to me while racing with skinned cars. Thank you. Martin Slezak wrote: Thank you Mario. Could you please also upload your skin as well? Today I was racing with some of you, but I saw only Luca's skin :-)) It adds so much immersion to me while racing with skinned cars. Thank you. mario gilles wrote: A fast lap. 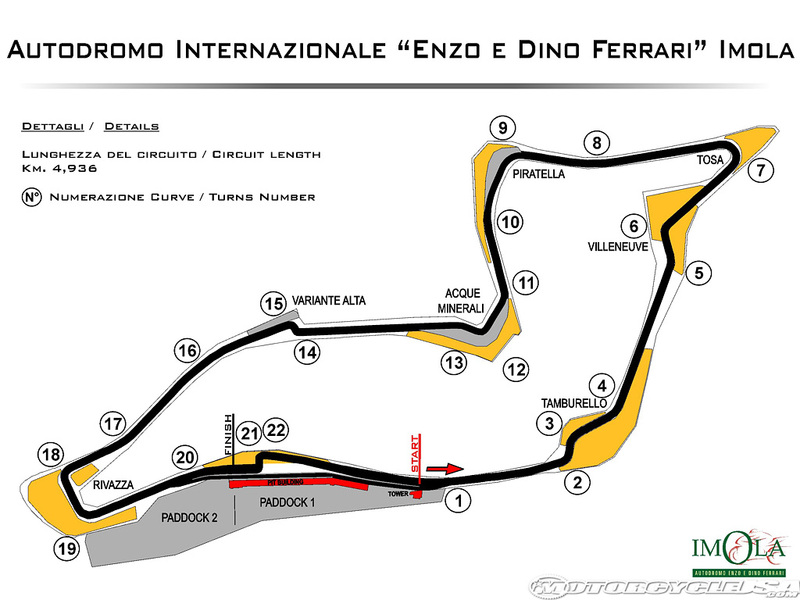 Ho fatto notare la cosa solo per evitare che qualcuno possa avere dei dubbi riguardo la regola per quella curva. Era a fin di bene. we must send the replay of the prequal lap?? replay not needed. We trust you guys...and laptimes say it all. i think laps with yellow flags should not count.. other than that...i like Luca's lap better than Mario's, Mario went far from the green side in turn 13 and in turn 15 even touches the grass. If you/we call the grey gutter at the inside of the curb as a little curb extension (at corners with curb extension the curb is still part of the track) the Variante Alta is ok on your lap, I think you're still on the red curb there at least. Nice & clean looking lap ! Penso che prima di ogni evento ufficiale sia meglio istituire un server di "Practice" con tempo illmitato piuttosto che uno con solo pochi minuti di qualifica seguito da 2 gare!Spesso questi server sono tra l'altro gestiti da amministratori che riavviano le gare saltando direttamente la qualifica e non è sempre facile trovare un buon tempo in mezzo al traffico! E' sicuramente importante confrontarsi con gli avversari.......(per prendere le misure), ma non sarebbe meglio istituire un server con le gare solo due/tre giorni prima dell'evento ufficiale?